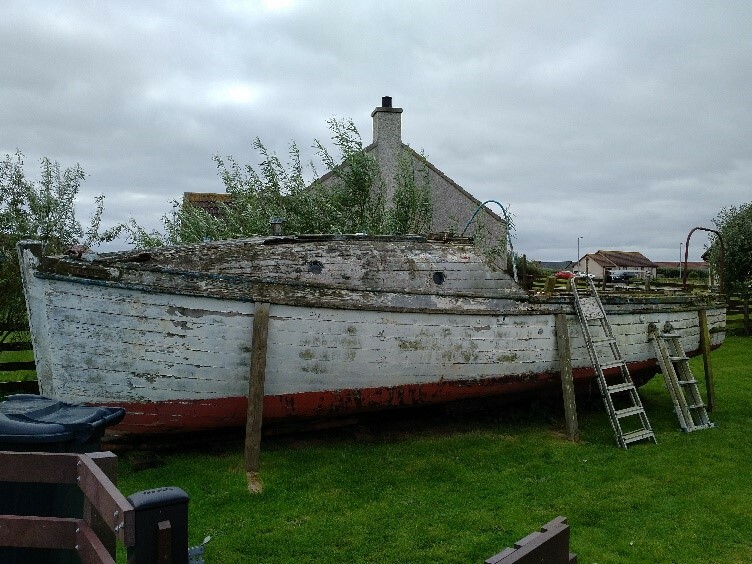 Cingalee, built in 1905 by Camper and Nicholsons, Gosport, Hampshire served most of her life in Orkney, initially supplying Naval vessels in Scapa Flow during and between the wars and latterly as a pleasure craft. 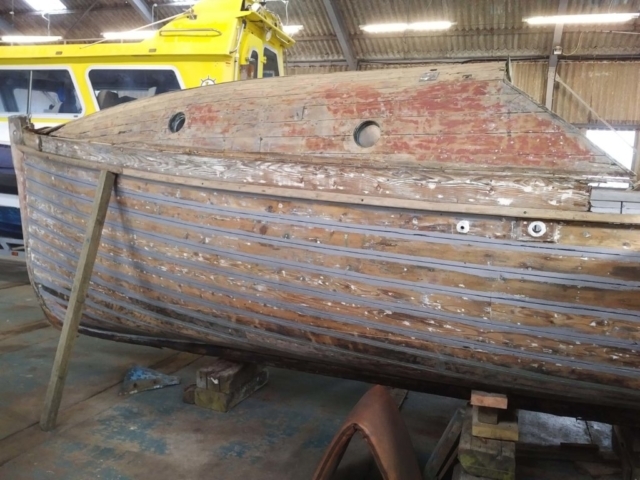 OHBS acquired her in 2017 and despite her condition, such is her significance to the Naval history of Orkney and unusual design, she merited saving. She was Lloyd’s registered in 1905 and the registration number can be found carved onto a beam under the fo’c’sle. The company of Camper and Nicholsons was formed in 1863 although the original shipyard started in 1782. 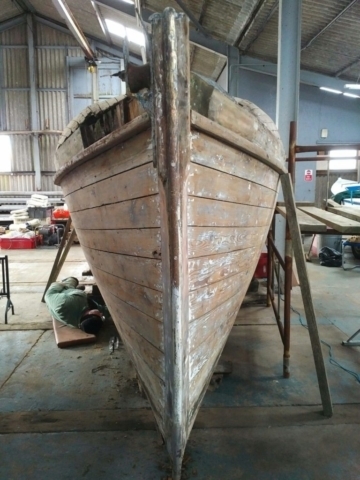 The design and construction of large schooners and famous racing yachts dominated the firm’s output. However, after the turn of the 20thcentury the yard was commissioned to build patrol boats, minesweepers, coasters, and other smaller naval craft for the Admiralty as the clouds of war were gathering. 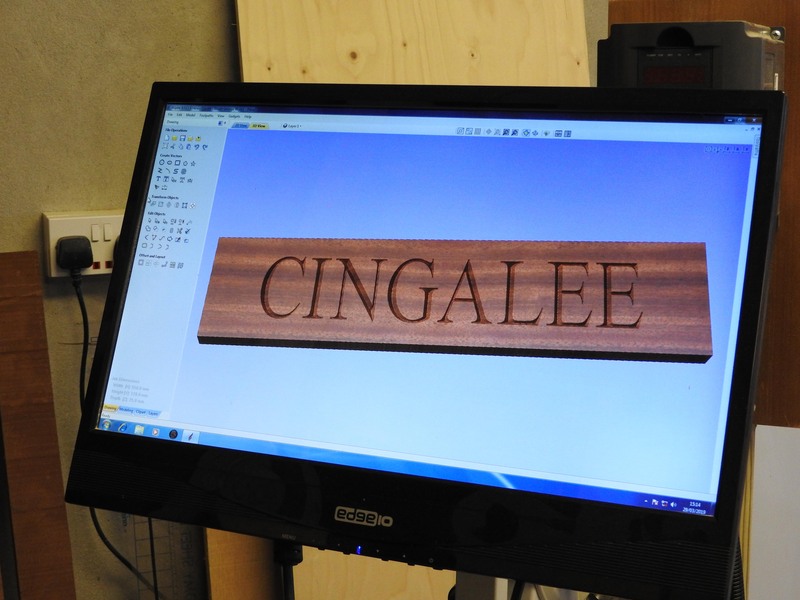 Cingalee was built in 1905 for John Mellish de la Taste a bank actuary originally from Jersey in the Channel Islands. 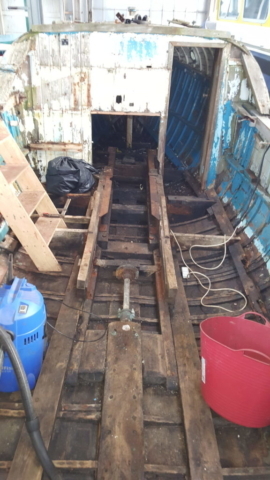 Cingalee was probably operated as a private boat in Portsmouth by John Mellish de la Taste until 1910 when she was transferred to William Miller Ltd of Portsea near Portsmouth. 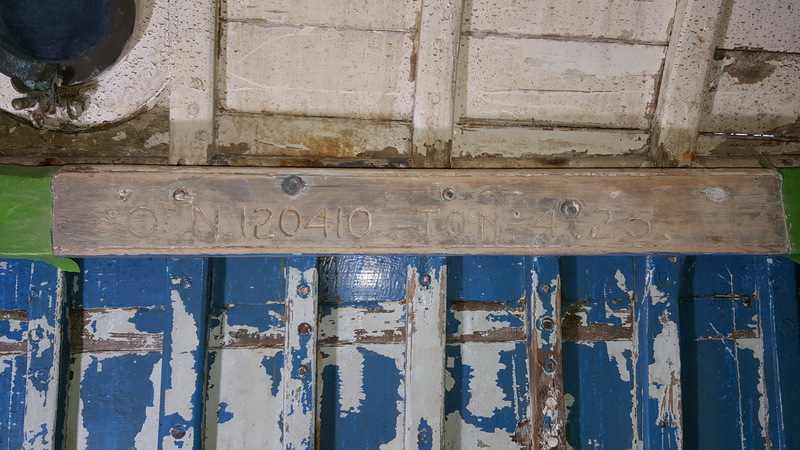 William Miller Ltd. was a Royal Navy contractor based at St. George’s Square, Portsea, Portsmouth. 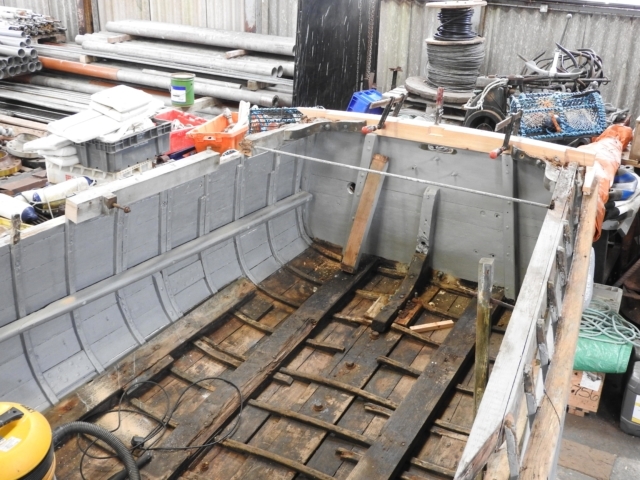 They operated canteen boats that supplied goods to Royal Navy ships in various harbours. 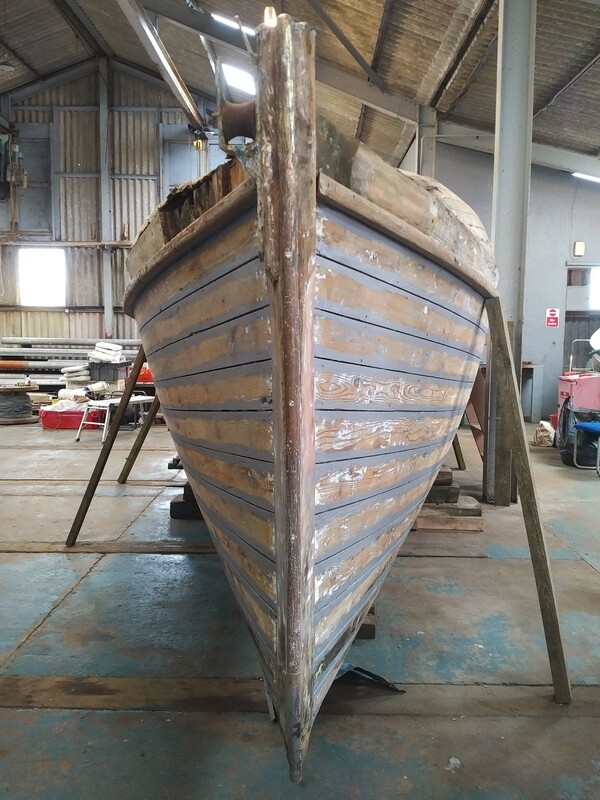 Cingalee may have been requisitioned by the Royal Navy after the passing of the Defence of the Realm Act (DORA) on 8 August 1914 or she may have remained under the ownership of William Miller Ltd until the Navy and Army Canteen Board (NACB) was formed in 1917. 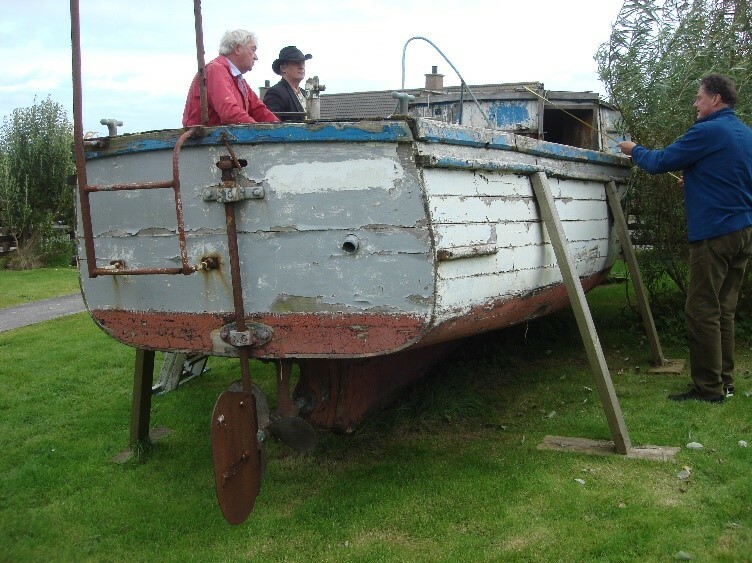 Typical small launches built for the Admiralty by Camper and Nicholsons. 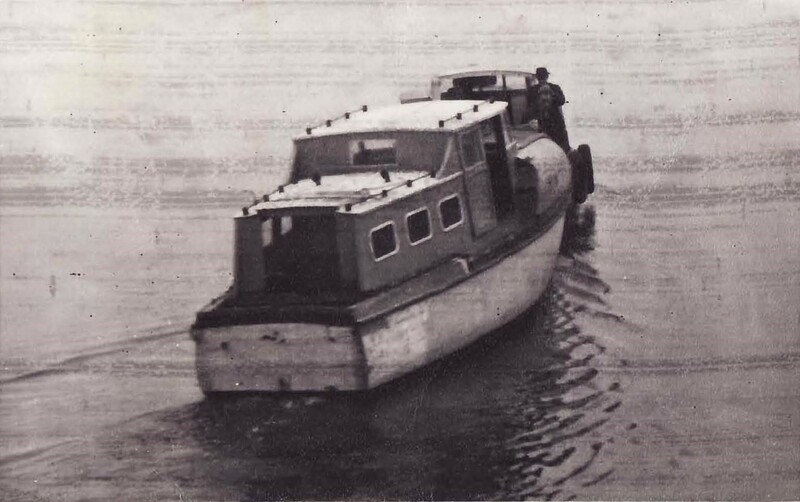 Cingalee was designed as a fast motor launch and was fitted with J W Brooke & Co 15-20hp 4 Cylinder petrol engine similar to the one shown below. 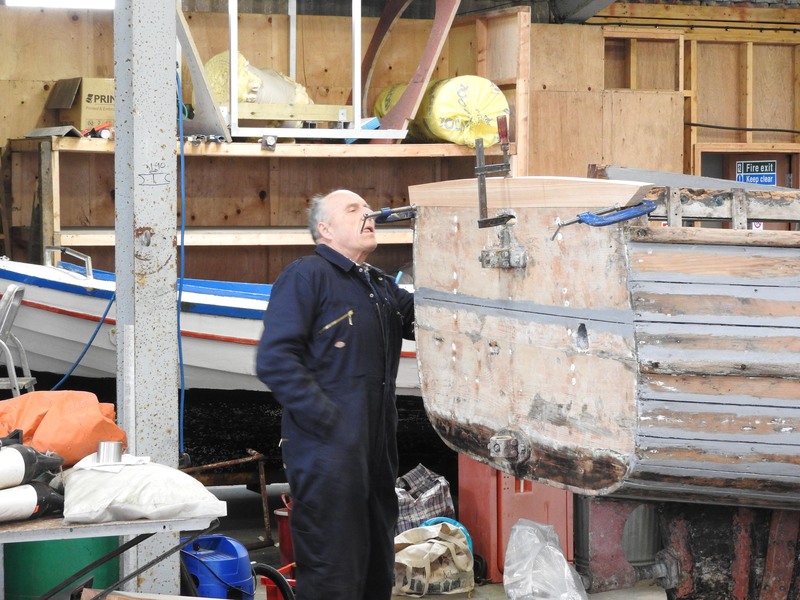 J W Brooke & Co specialised in the construction of motor vehicles, fast boats and petrol internal combustion engines. 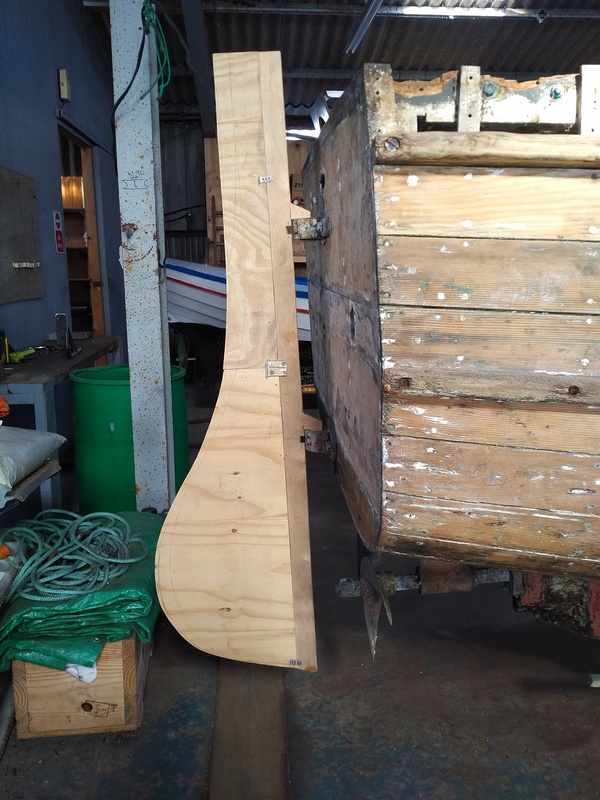 Although built as a motor launch she was also fitted with a mast and Lug sail. Johnny Meil recounted that Cingalee was a supply vessel and was originally operated by a French woman out of Scapa ferrying supplies to Royal Navy ships before World War 1. 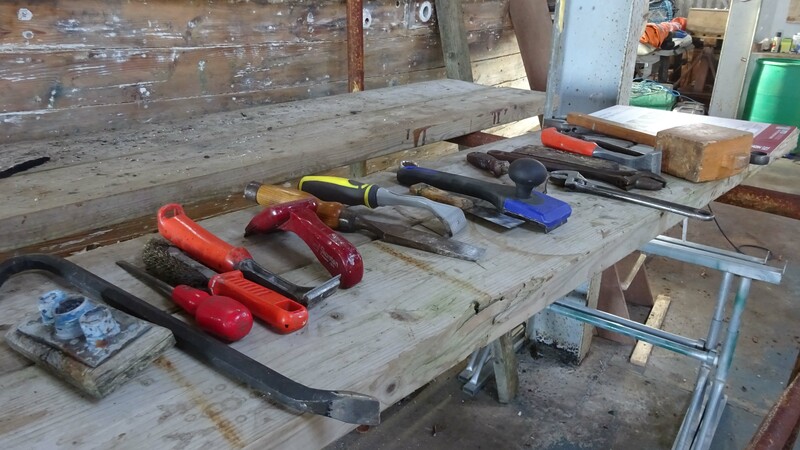 Prior to 1914 canteen supplies were mostly contracted out to private firms. 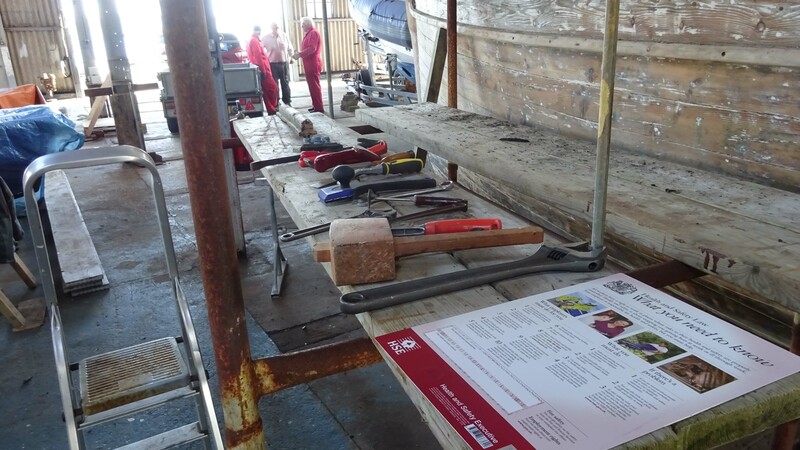 In 1914 and during the First World War the ‘Expeditionary Force Canteens’ was created and run by uniformed members of the Army Service Corps. 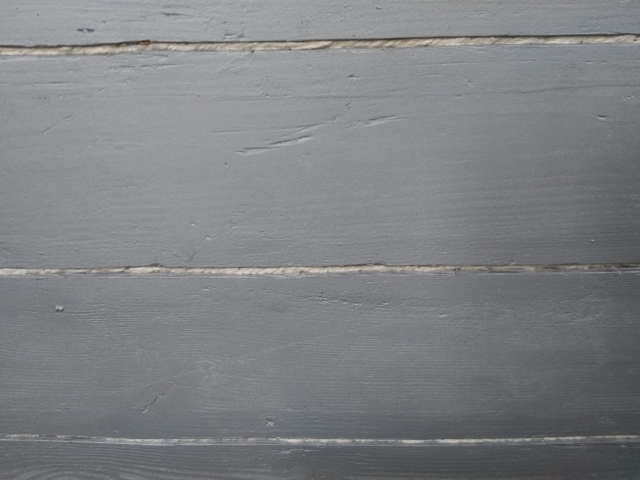 In 1917 the ‘Army Canteen Committee’ was created and later became the ‘Navy and Army Canteen Board’ absorbing the ‘Expeditionary Force Canteens’. 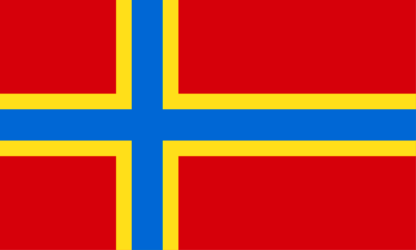 In 1921 this became the ‘Navy, Army and Air Force Institutes’ (NAAFI). 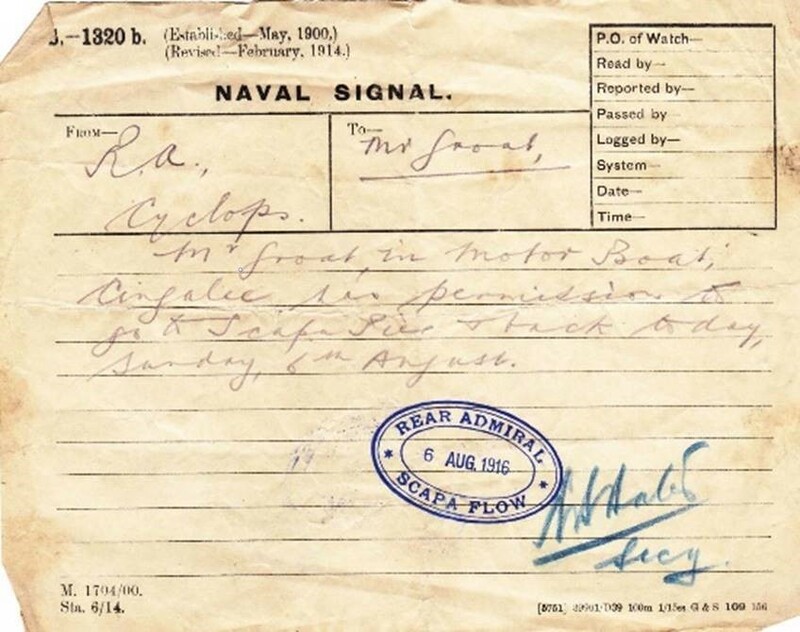 Below is a Naval Signal which gives Mr Groat, in Cingalee, permission to travel between Scapa Pier and HMS Cyclops, a Royal Navy repair ship, on 6th August 1916. 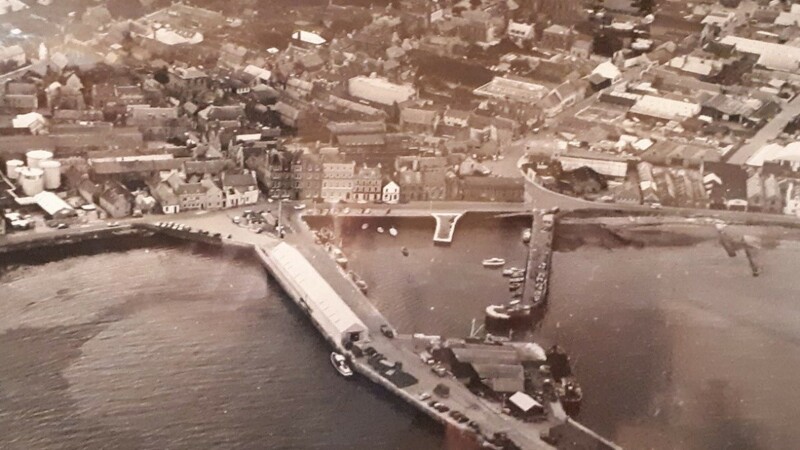 JMF Groat, had started a shop at Longhope in 1911 and at that time the island was a very busy and prosperous place partly due to the Royal Navy having arrived in strength in the summer of 1908. 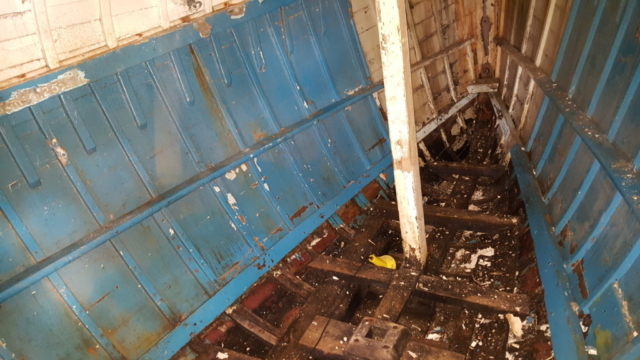 The Admiralty realised that Scapa Flow was the only safe anchorage on the East Coast of Britain. 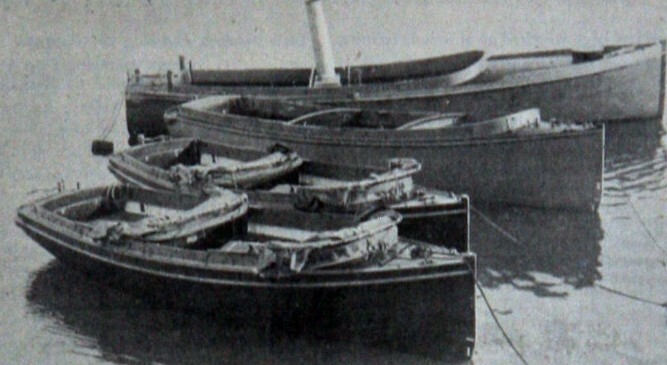 Other anchorages such as the Thames, Forth Estuary and Invergordon could easily be blockaded by the enemy simply by laying mines across the entrance from a submarine. 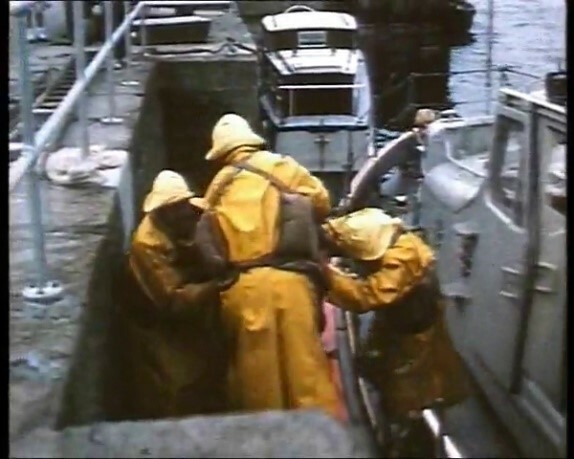 Scapa Flow had three entrances so less likely to be blocked. 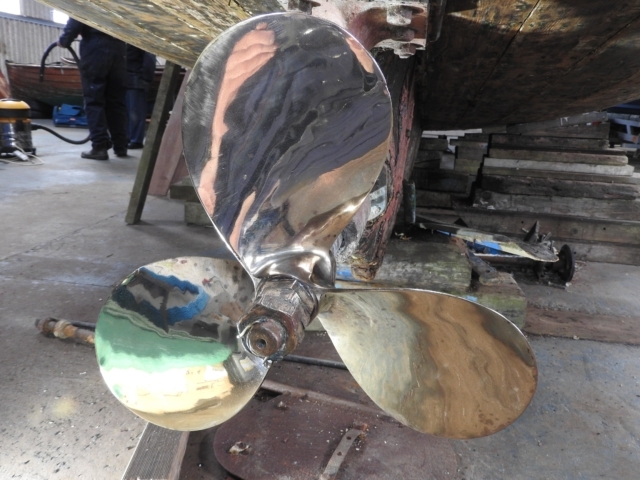 It was known that JMF Groat used Cingalee to supply ships in Longhope Bay and Scapa Flow during the first world war. 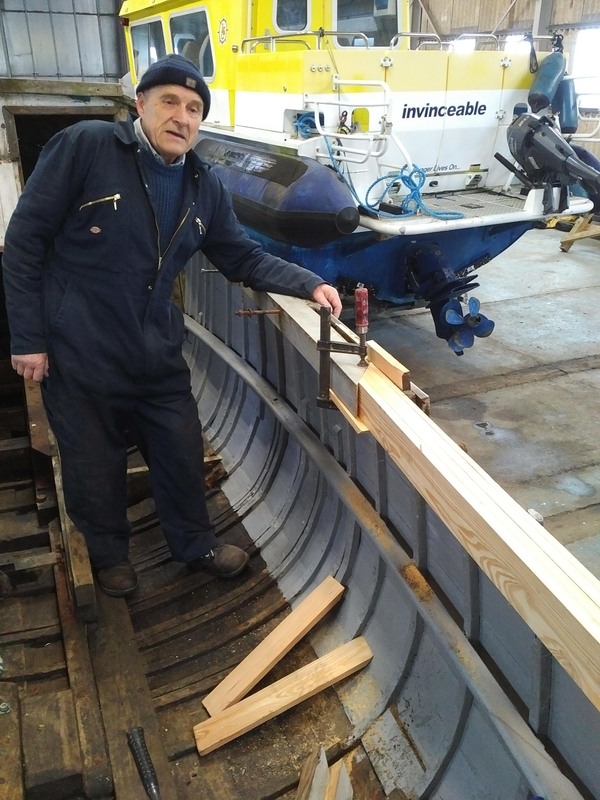 JMF was a popular man and very friendly with the Naval personnel, both aboard ships and ashore so that is why it is likely he would have been chosen to operate Cingalee. 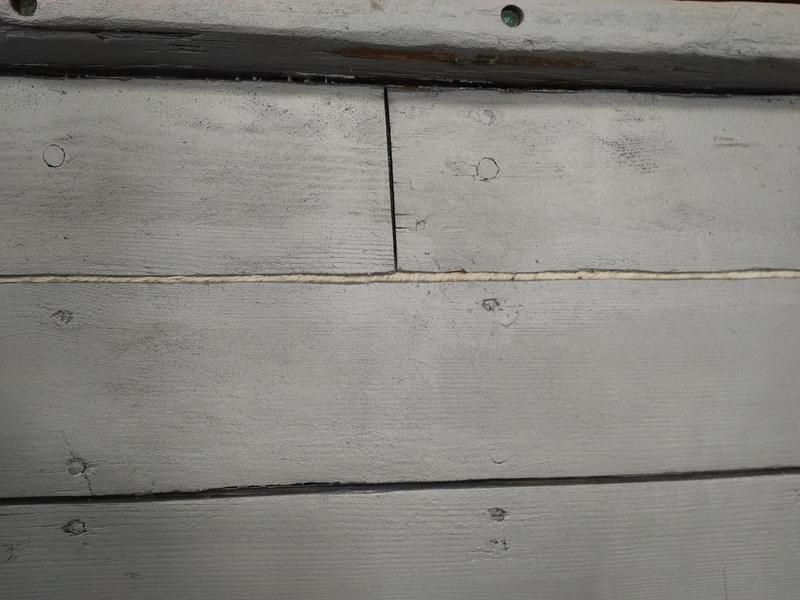 On one occasion a ship’s captain asked JMF Groat to look after his dog because he was no longer allowed to keep it aboard the ship. 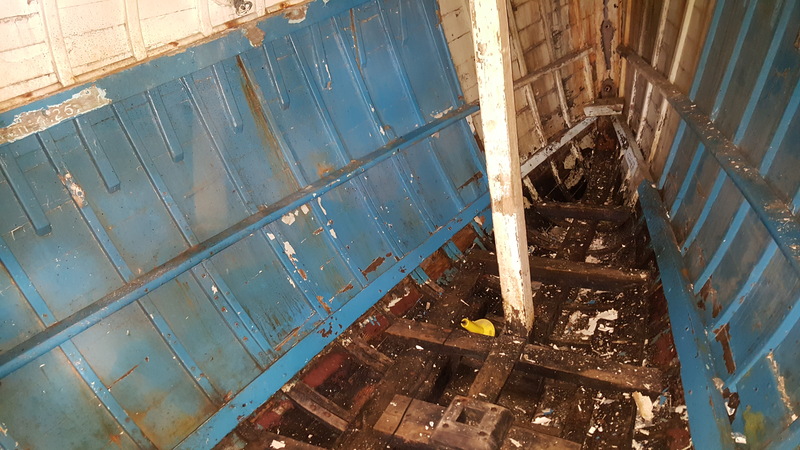 Johnny Meil also stated that before the British Naval Fleet set off for the Battle of Jutland in May 1916, the ships were ordered to get rid of as much combustible material a spossible. 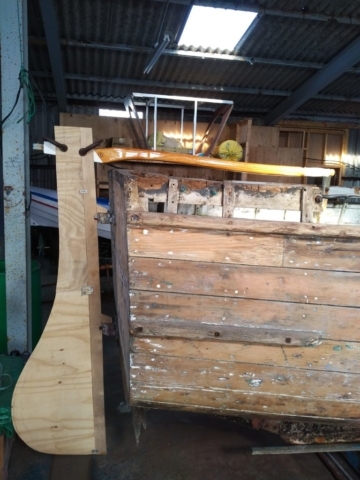 Many wooden objects were thrown over the side, furniture, pianos, dinghies, etc. 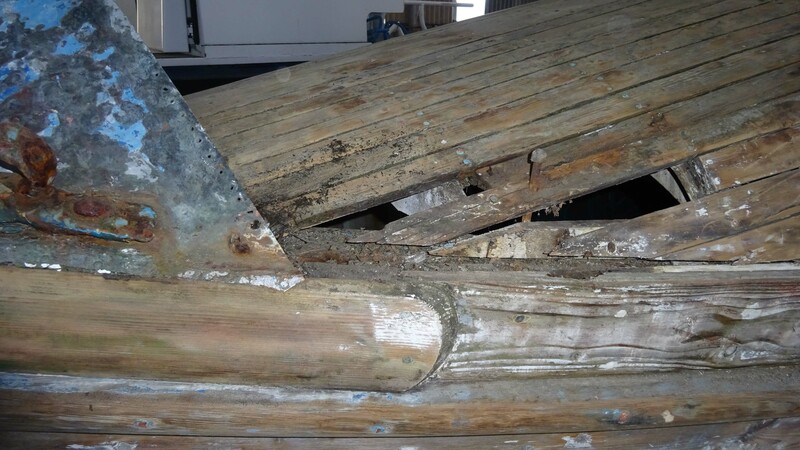 Johnny said the shoreline below his house was littered with wooden jetsam including wrecked boats. The whaleback foredeck on Cingalee is original, there would probably have been a canvas hood and frame aft of the foredeck. 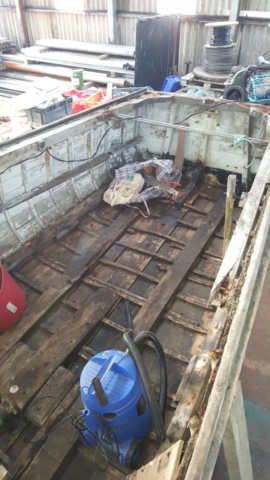 The after deck was open and the wheelhouse and aft cabin were added at a later date. 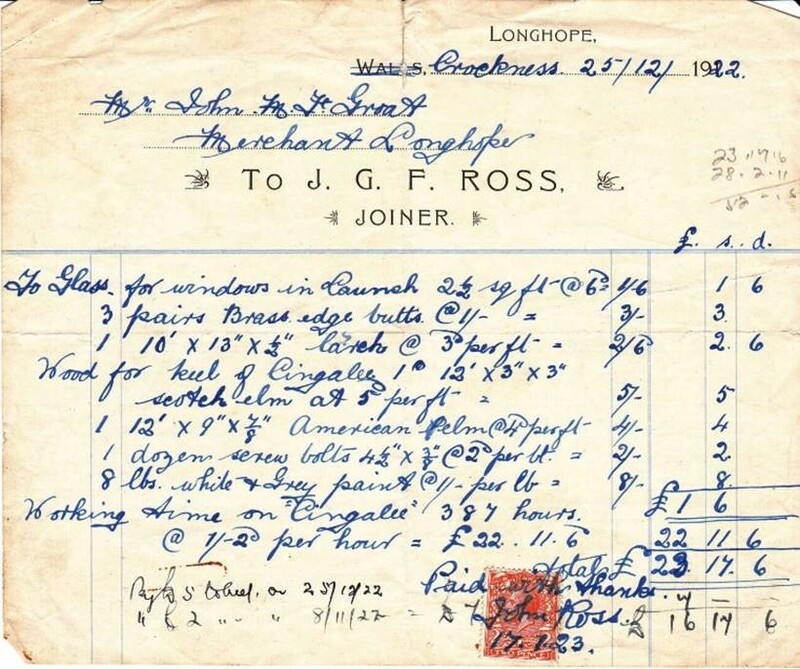 Correspondence from an A Pottinger who worked for ‘His Majesty’s Service’ and was in charge of the ‘Navy and Army Canteen Board’ in Kirkwall indicate that he was in charge of Cingalee until early 1920 when he made efforts to sell her to JMF Groat. 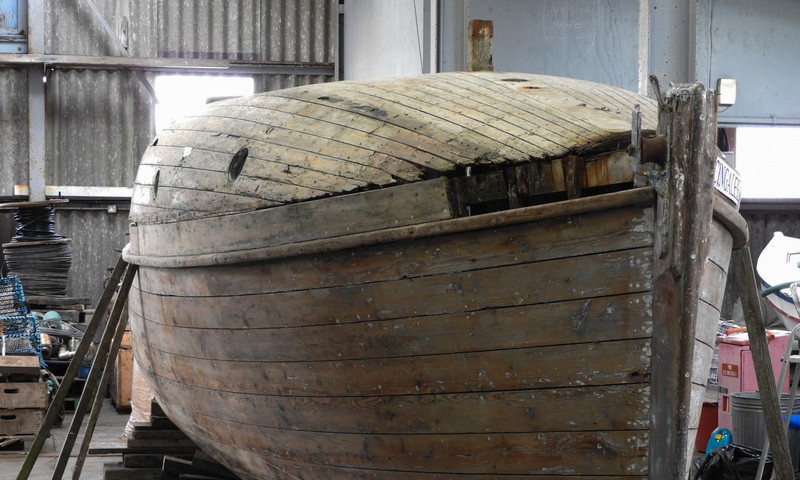 How about the Cingalee, I cannot get her away in Victorious, but can get her sent down later on in a collier. Well I don’t want to be bothered with waiting about, & in view of our conversation on the subject can you write or wire me an offer say £205 for her, & if so I will put her up to London & recommend a sale. I have several enquiries for her but I have put people off by saying that she is to go South so it is entirely in your hands. 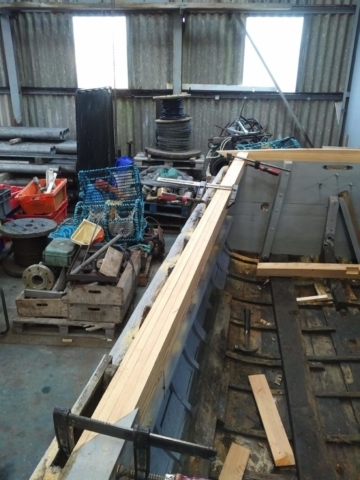 There is a mast and sail, kit of tools, 6 new plugs, & a quantity of spare parts to go with her if you get her, & she is an absolute bargain. She may require a very slight bit of carpentry work done, but Jim Norquoy could do that cheaply enough. Well I will leave the matter until I hear from you. 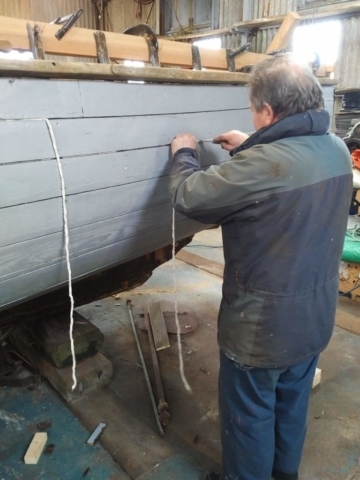 It would seem that JMF Groat has asked Mr Pottinger to make sure all the defects were sorted before he would buy her. However, it wasn’t long before some major work had to be done on Cingalee. The following receipt is for work completed on Cingalee in 1922. The work was completed by John Ross of the North Ness in Longhope. 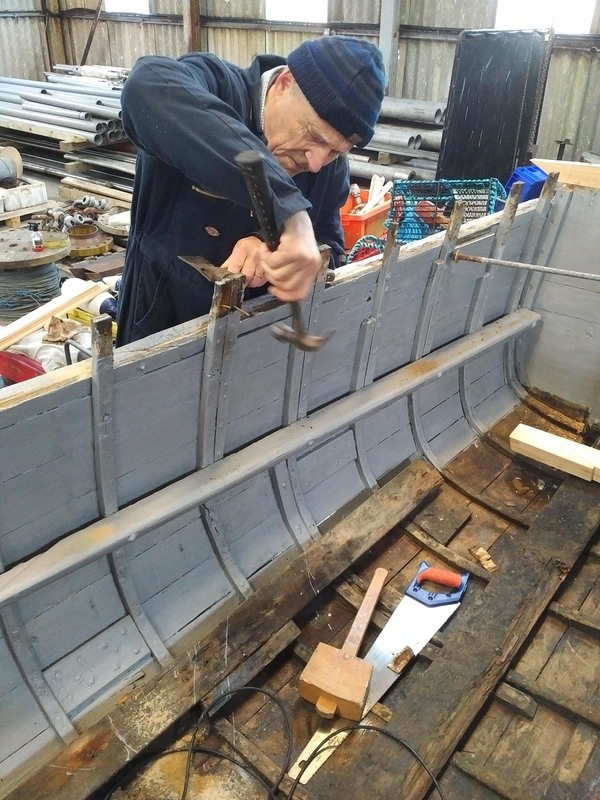 Jimmy Thomson worked as an apprentice for him. 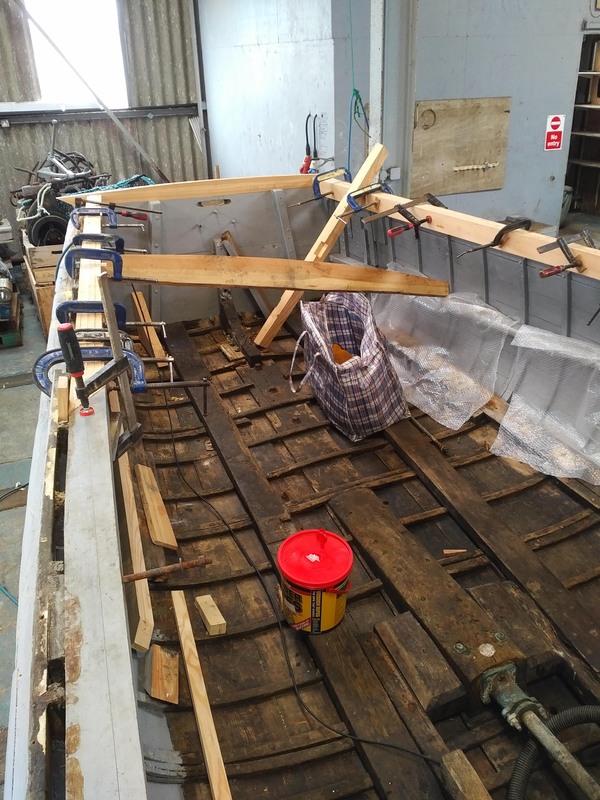 The hull was re-caulked, and a new keel fitted. This could also have been when the aft cabin was fitted. 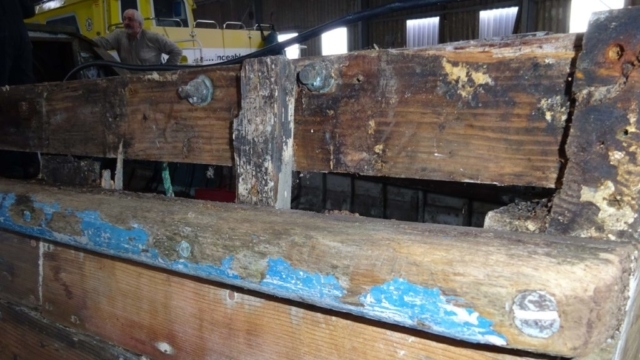 Having a new keel fitted when the boat was only 17 years old would make you think some kind of accident had befallen her, possibly having gone aground. Jimmy Thomson went on to become a very respected and accomplished diver with both Cox and Danks and Metal Industries during the salvage of the German High Seas Fleet in Scapa Flow. 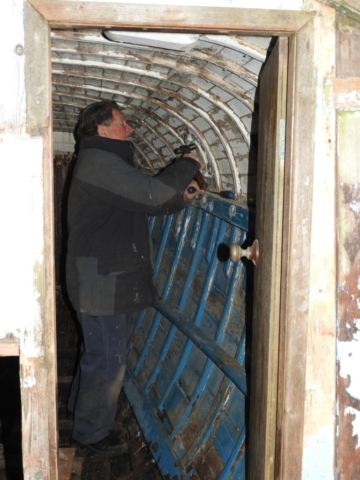 He was also one of the first divers to dive on the wreck of HMS Royal Oak following its tragic sinking in October 1939. 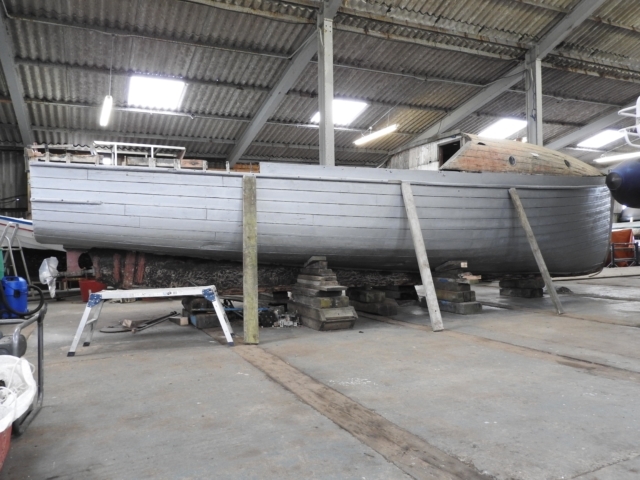 As well as Cingalee, JMF Groat bought the launch ‘Von Reuter’ at an auction sale after WW1. The Von Reuter was used by the German Admiral of the Fleet when the German Fleet was interned in Scapa Flow. 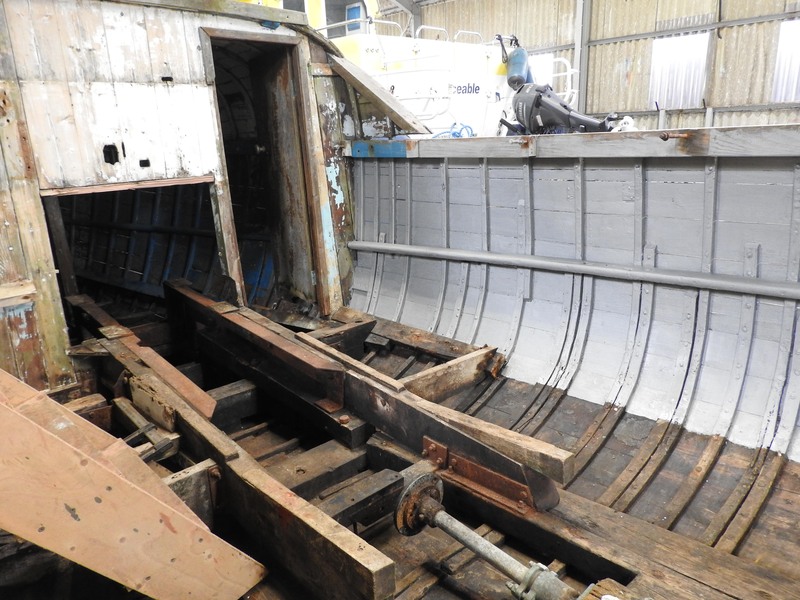 Both Cingalee and Von Reuter were used between the wars and during WW2 to supply ships in the flow. 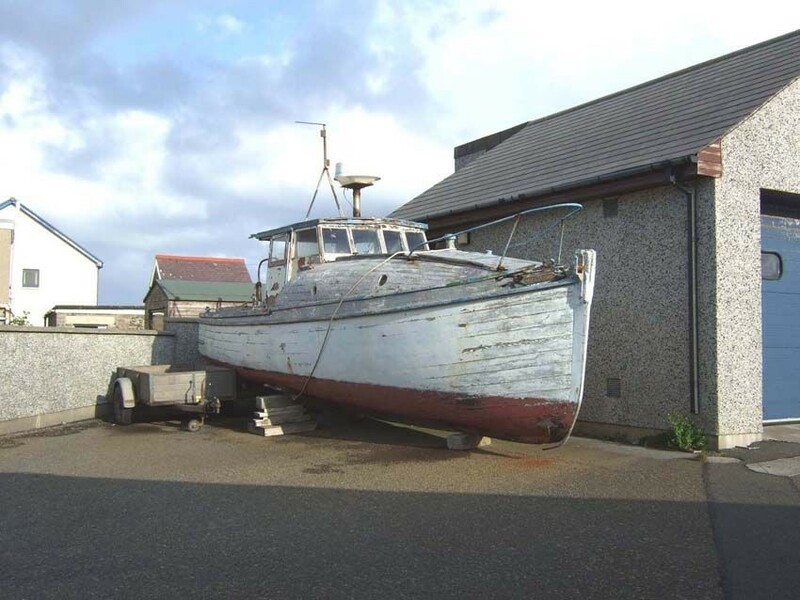 After WW2 the Von Reuter became the boat of choice and was used on numerous occasions to transfer residents of Longhope to Scapa for hospital admittance. 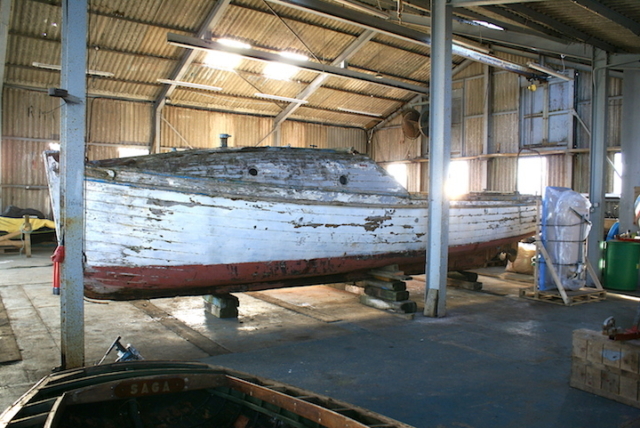 In the quieter period after WW2 Cingalee was largely left idle. Arnold Grieve, who was married to Betty Groat, daughter of JMF Groat, was given the boat by his brother-in-law, Jackie, in the late 1950’s or early 1960 or 1961. 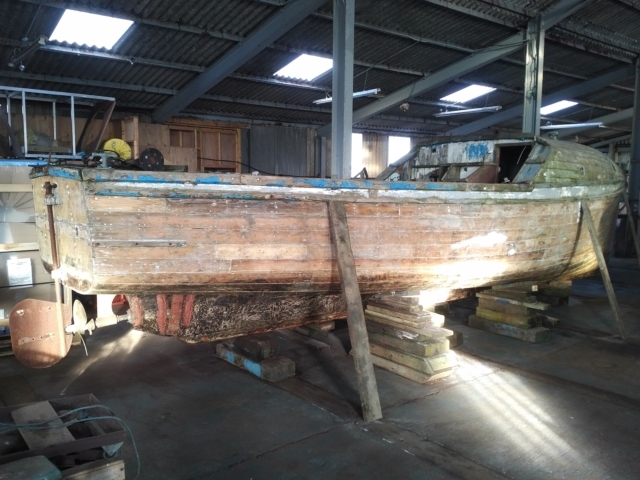 Prior to that she had been ashore, originally in the boat shed behind the shop, or alongside the boatshed but latterly lying on the beach. She was in poor condition when Arnold took her on. He did a tremendous amount of work on her, to a very high standard, including fitting a new stem head and stern as well as a Ferguson diesel engine. Some reports say this was a London Taxi engine which of-course is the same type of engine, a Perkins Diesel. 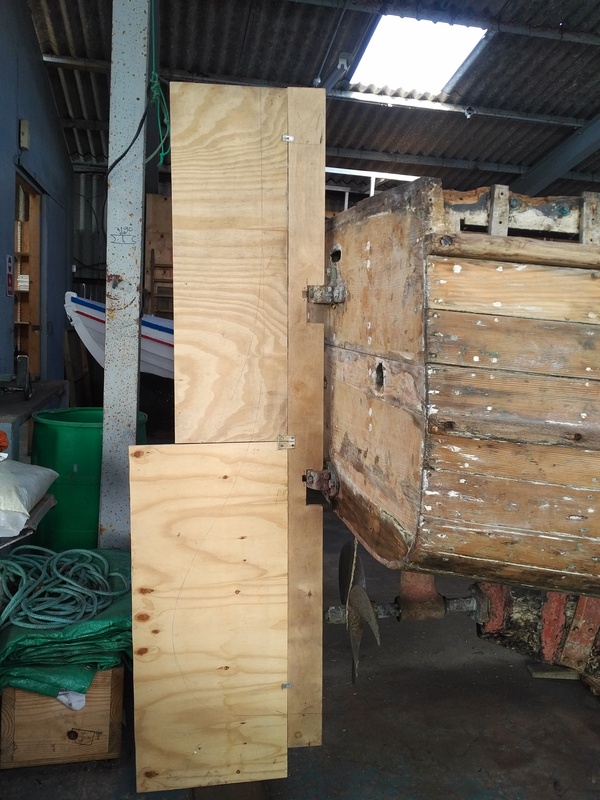 Johnny Meil recounted that Arnold designed and fashioned an adapter to mount the engine, which is still in her, onto the existing gearbox. 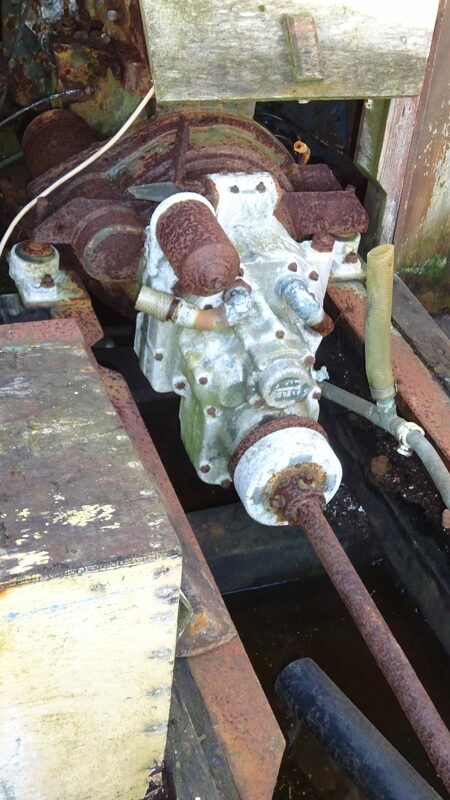 There are invoices which would indicate that the engine in Cingalee at the end of WW1 was a 40/50hp 6 cylinder Gleniffer Motor of Glasgow which was replaced with an American Scripps V8 Lorry engine, possibly in WW2. Cingalee was towed from Longhope to Houton by Jimmy Wilson who was local to Longhope and worked at the Lyness Naval Base with Arnold in the 1950’s. 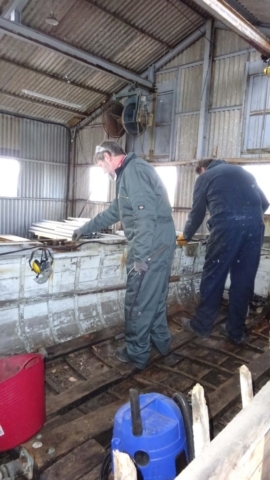 Arnold was able to work on the boat inside the shed which is now occupied by Birsay Farmers. After her restoration she was re-launched in 1964. Both the following pictures show the Cingalee behind the Longhope Lifeboat, we believe, taken in August 1964 on her first visit to Longhope soon after Arnold had restored her. 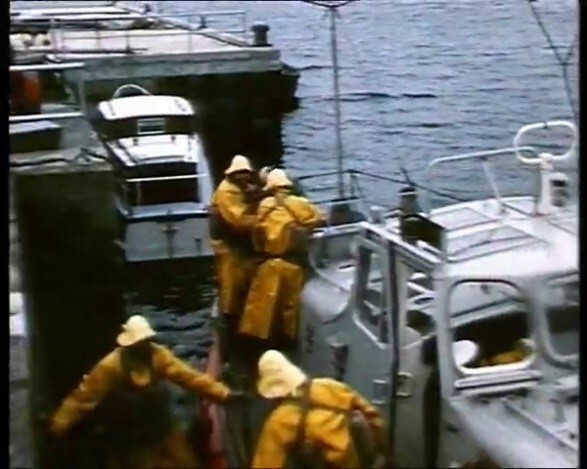 These pictures were extracted from a film depicting the rescue of the crew of Aberdeen Trawler ‘Ben Barvas’ in early 1964. During part of the summer Cingalee would be anchored in Houton Bay to enable trips to Longhope to visit family. 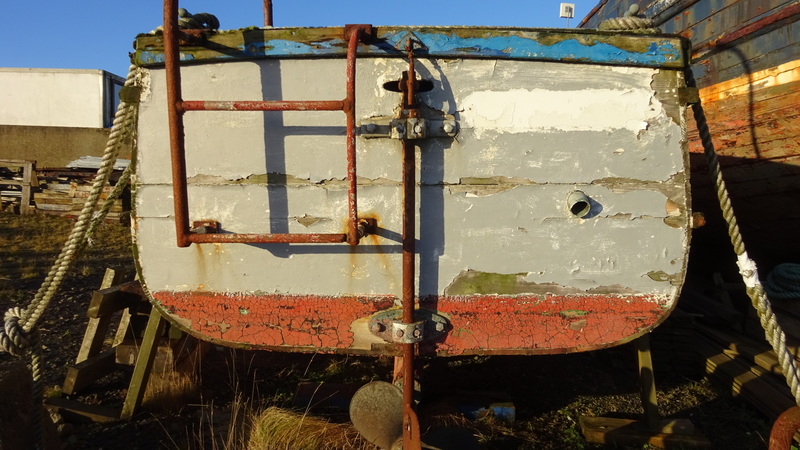 Arnold took the family trips to Shapinsay and Rousay, and fishing trips to Copinsay, when she was stationed in Kirkwall. She was anchored just off the South side of the Hatston Slip when not in the basin. His brother Bertie also used her as and when he wanted. 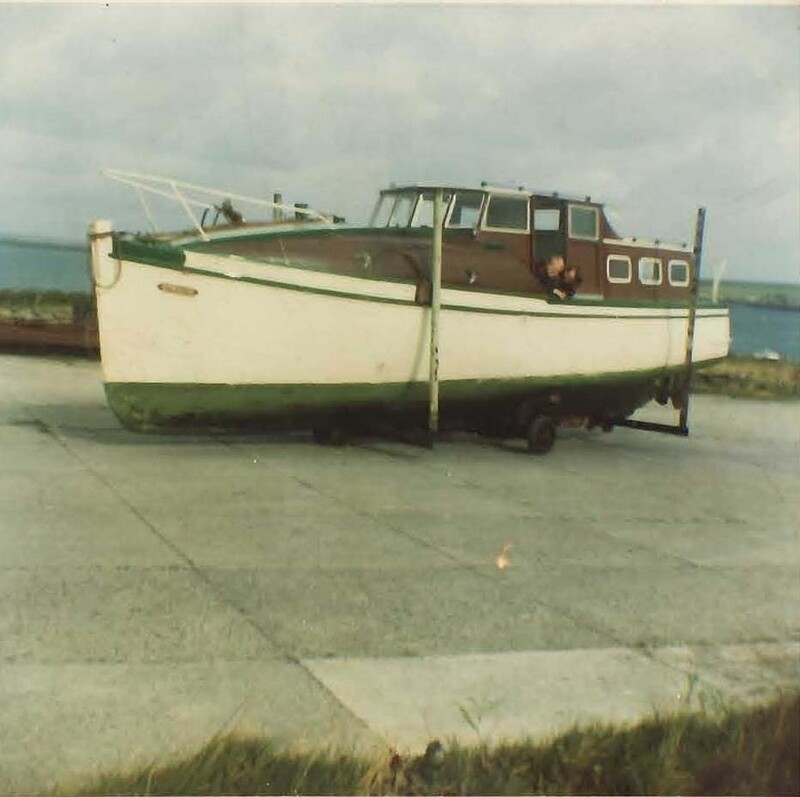 Cingalee hauled out on Hatston Slip in the early 1970’s on the trolley made for her. 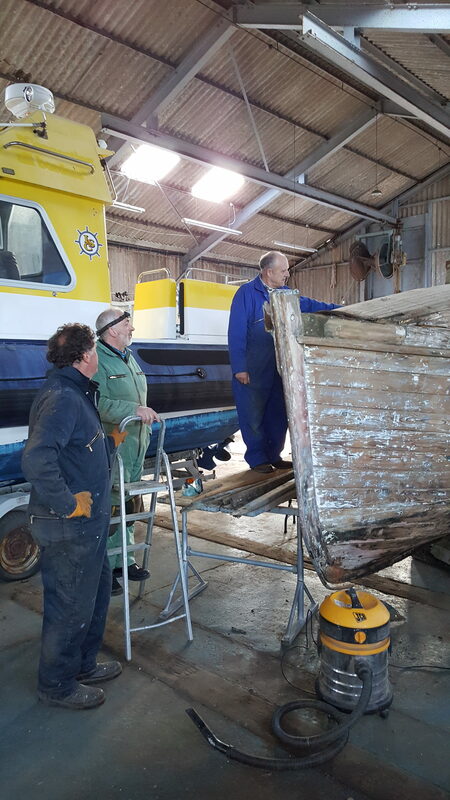 Arnold and Betty’s two boys, George and Nigel can be seen hanging out of the wheelhouse door. 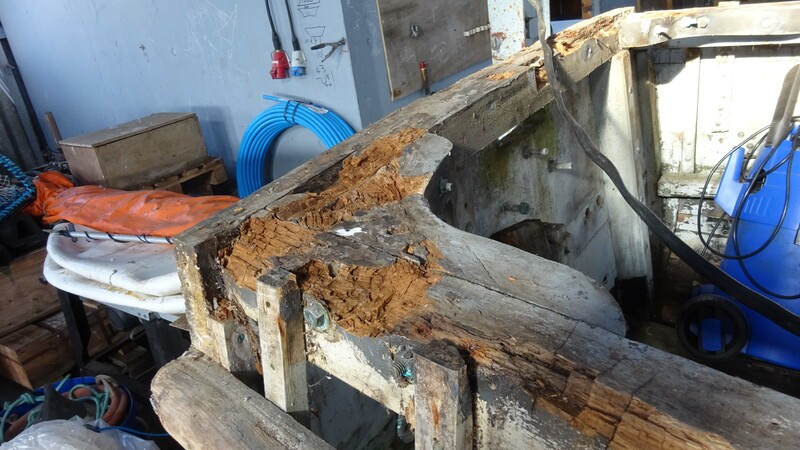 Sadly, Arnold lost all interest in the boat due to two incidents. 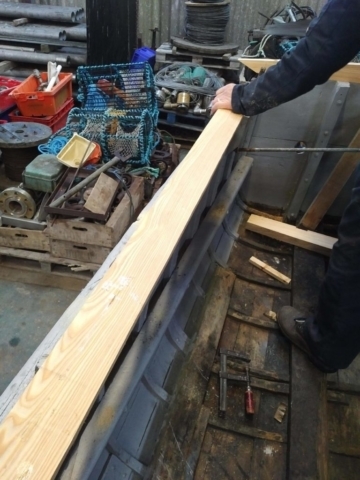 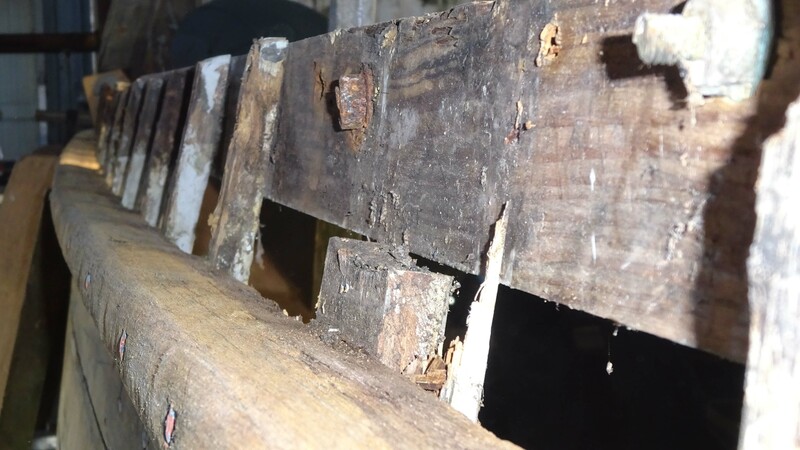 Firstly, the shed where he had her stored at Hatston over winter was broken into and several brass items were stolen including the compass and two brass plates fitted either side of the stern tube. 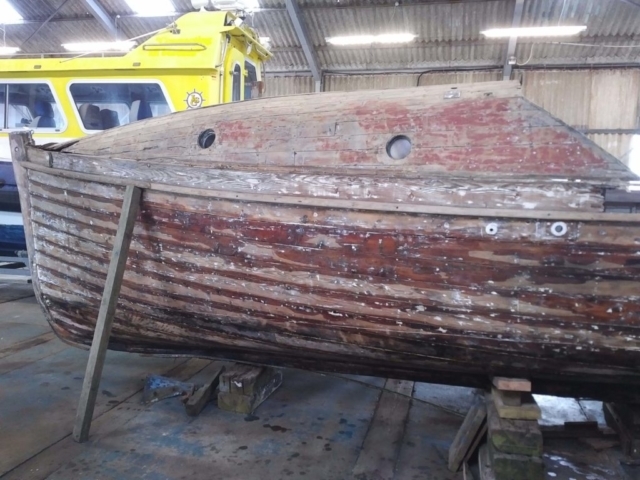 Secondly Bertie died suddenly in 1974 and because he had been an active partner in looking after the boat Arnold lost heart in doing much with it after that. 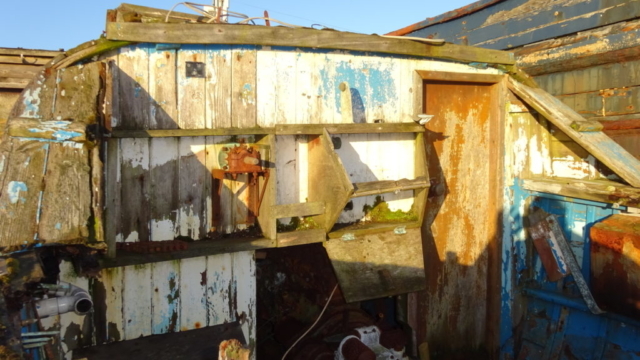 She spent the following 5 years in a shed in St Catherine’s Place, Kirkwall (now occupied by Williamson’s the butchers). Snipe Miller and Bob Cross then took an interest in the boat and she was sold to Bob Cross in 1979 or 1980. 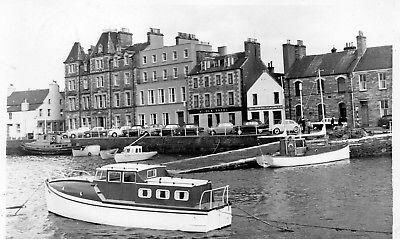 Mr Cross owned her for a year or two and then sold her to a Mr Middleton who lived in Burray at the time and now lives in Orphir. 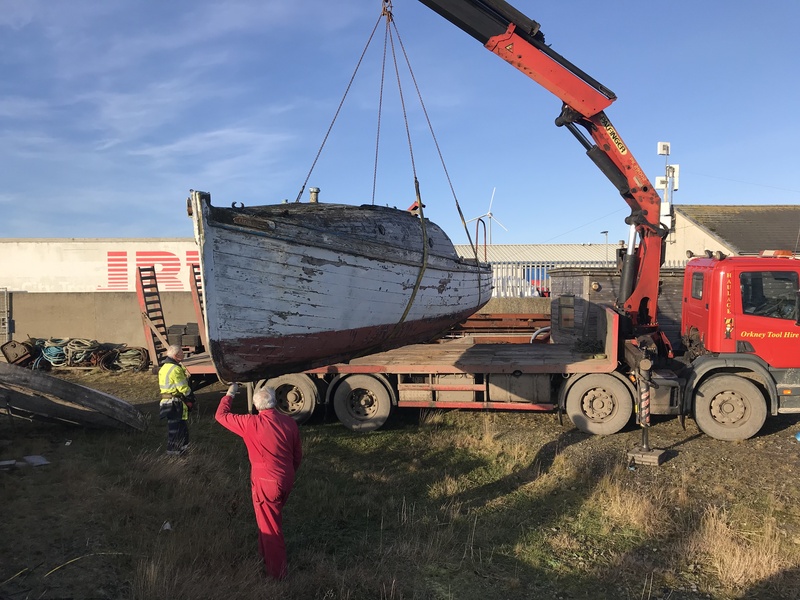 After that John Grieve from Kirkwall bought her so he could travel to Shapinsay daily as he was the skipper of the Shapinsay Ferry at that time. When no longer needed for the Shapinsay run she was initially stored outdoors in Smith Foubister’s boatyard at Hatston Slip then later behind the Coast Guard building on Cromwell road. 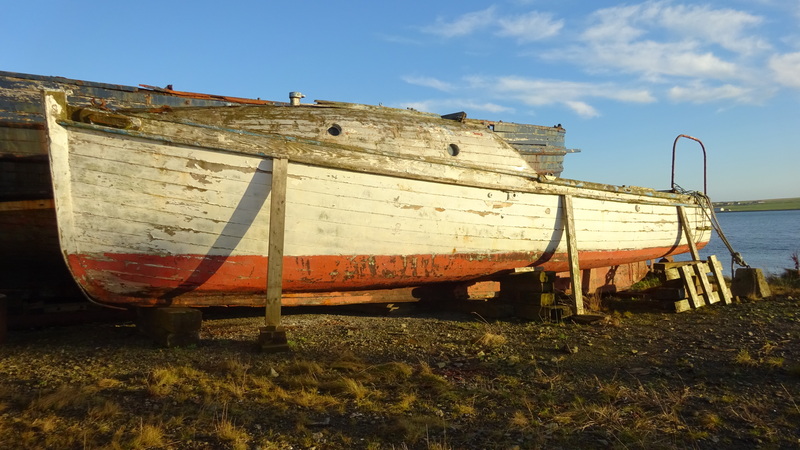 Cingalee then lay at Lingro farm near Scapa Distillery for many years. 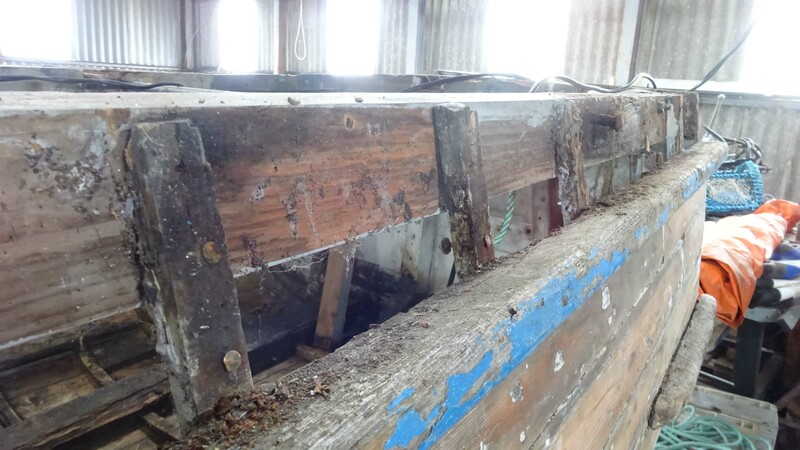 During this time the wheelhouse, cabin and all the wooden structures added at later dates, rotted away. 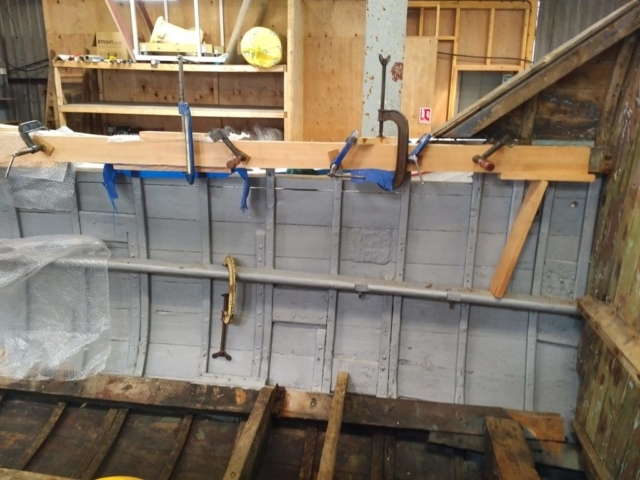 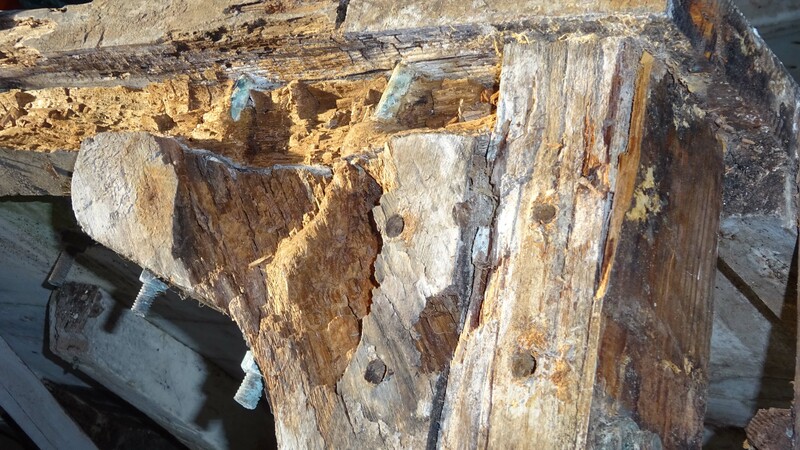 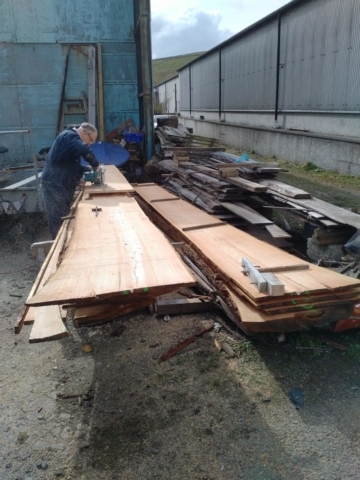 However, the original wooden hull, being built of Pitch Pine on Oak and copper fastened, is still in good condition 114 years after being built. 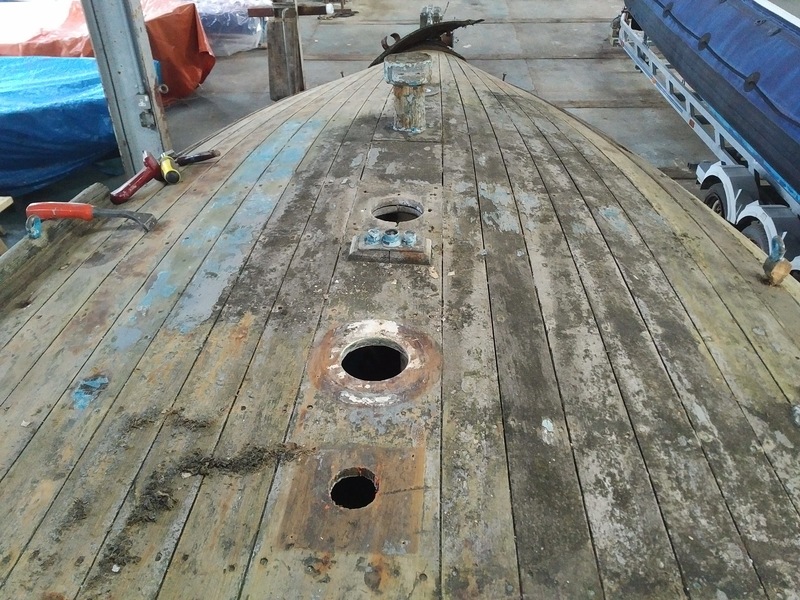 Smith Foubister was aware of the boat and suggested that OHBS enquire about taking her on. 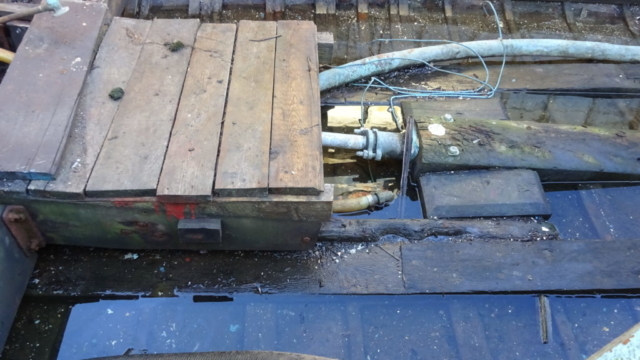 However, soon after this we learned that Roddy Flett had plans to restore her and had moved her to his house in Tankerness. 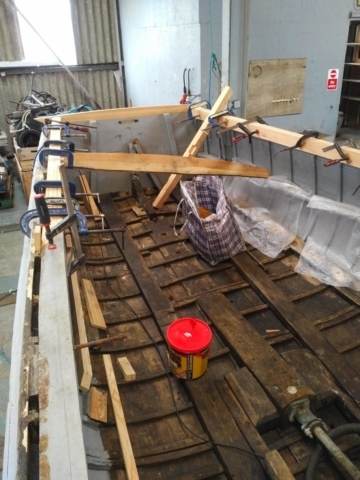 Eventually Roddy contacted OHBS to see if we were interested in recovering her as he had been instructed by his landlord that the boat couldn’t stay in the garden of his house. If we didn’t take her away, she was going to be burned. 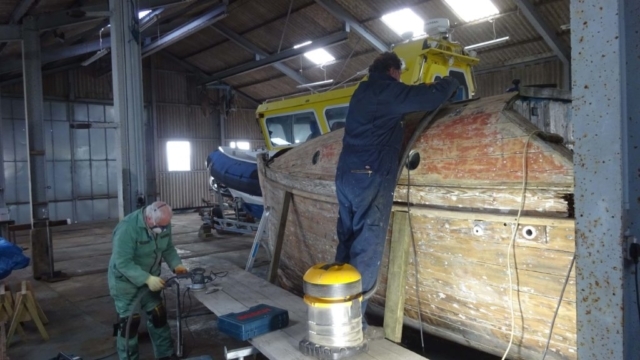 On inspection by OHBS, in November 2017, it was decided that the boat should be saved. The unusual name was noted on a plate seen Port bow as “Cingallee” which has proved to be an error in calligraphy following detailed research. 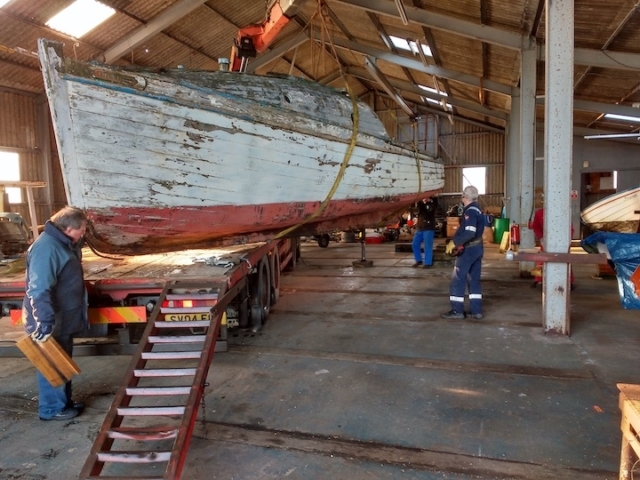 She was transported to Smith Foubister’s yard in Kirkwall for temporary storage. 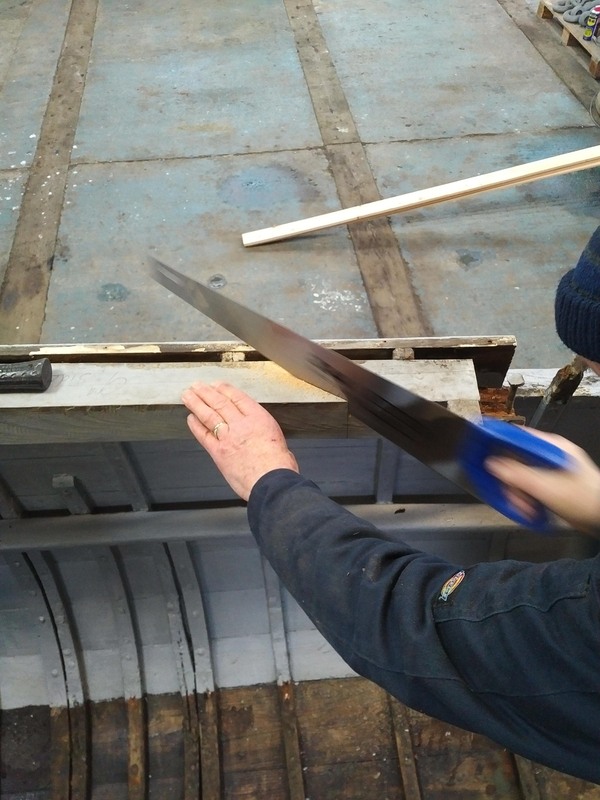 OHBS plan to dry her out undercover and then restore her to the original simple 1905 layout. Work starts with the clearing of several trailer loads of bruck (rubbish) from the inside of the boat. 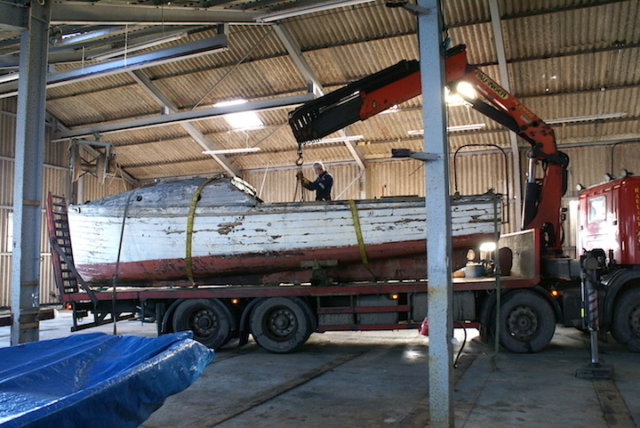 A seacock is removed from the bottom of the hull to allow standing water to drain. 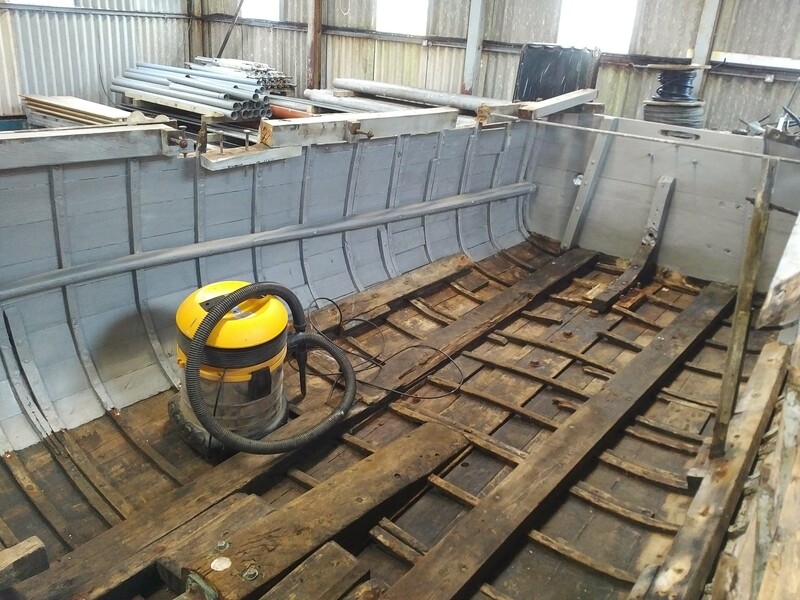 The inside of the hull is washed out to remove as much of the remaining dirt as possible while outside. The engine and gearbox are detached from the prop shaft and engine bearers. The engine and gearbox are removed to reduce stress on the hull when lifted. 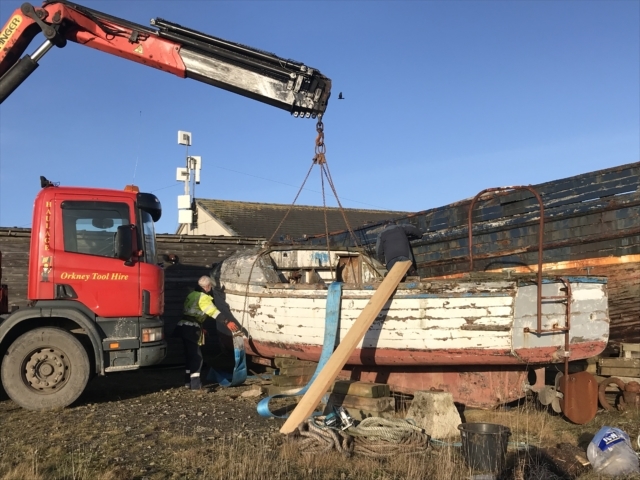 The boat is transported from outside storage in Kirkwall to covered storage in Stromness to begin drying out and allow subsequent restorative work to take place out of the weather. 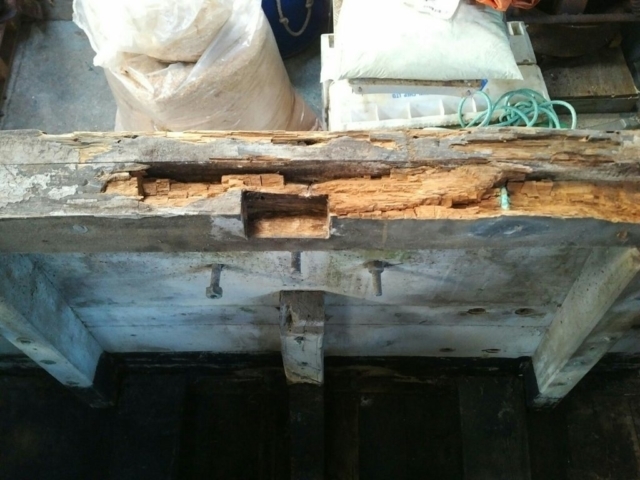 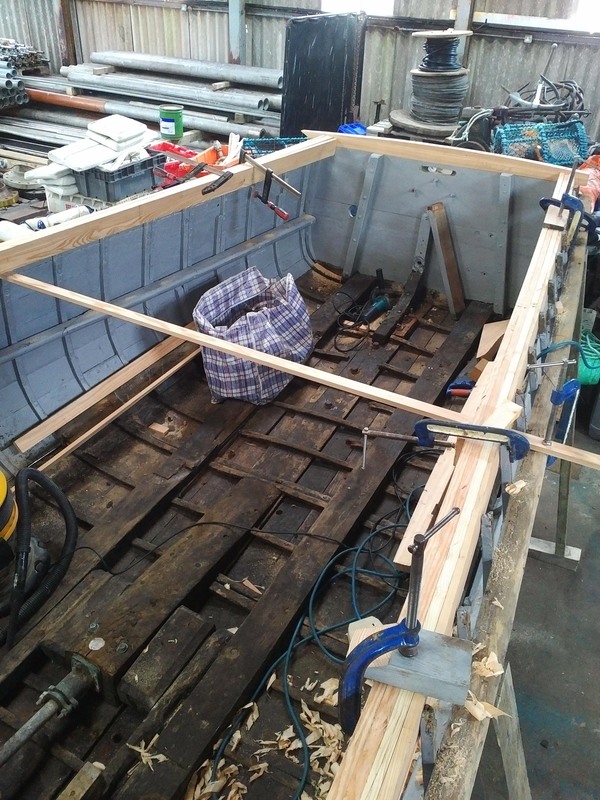 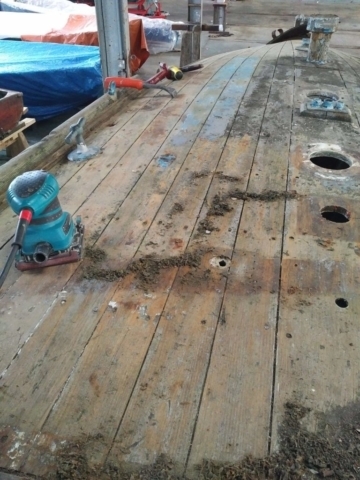 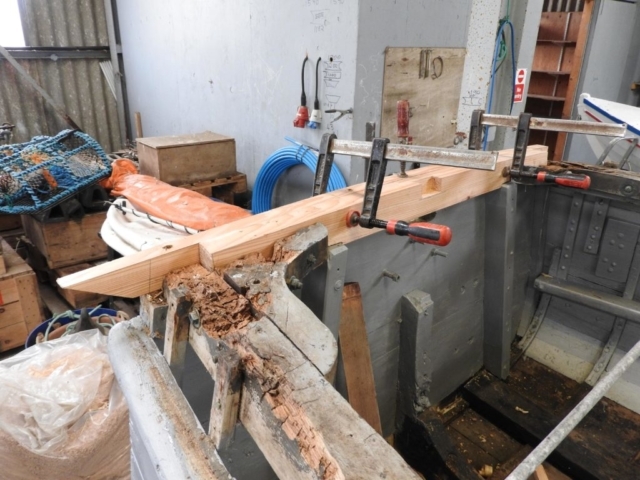 The hull is stripped back to wood to improve drying and all rotten wood and non-original wood and fittings are removed. 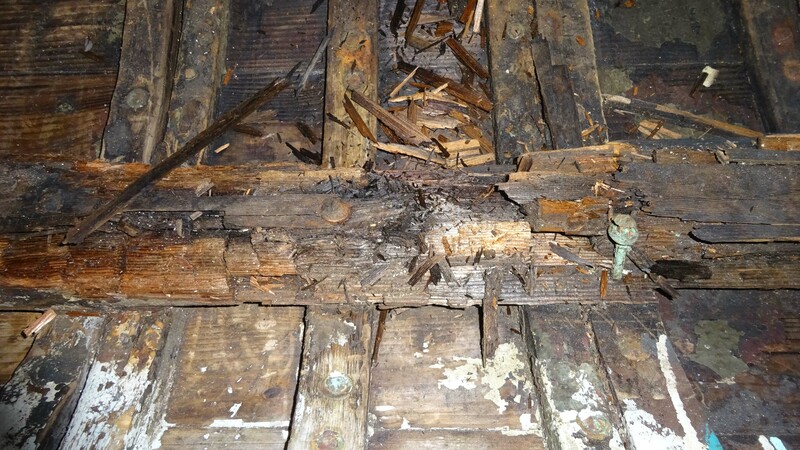 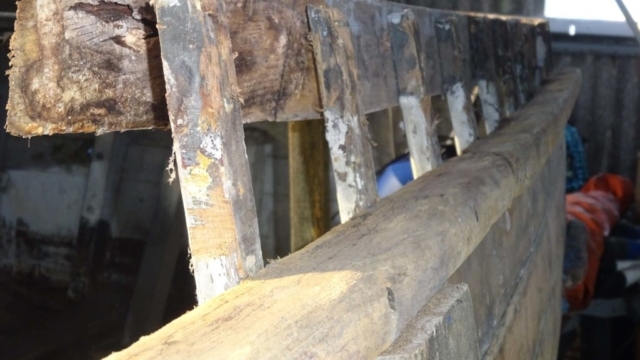 Further rotten wood is removed from above rubbing strakes. 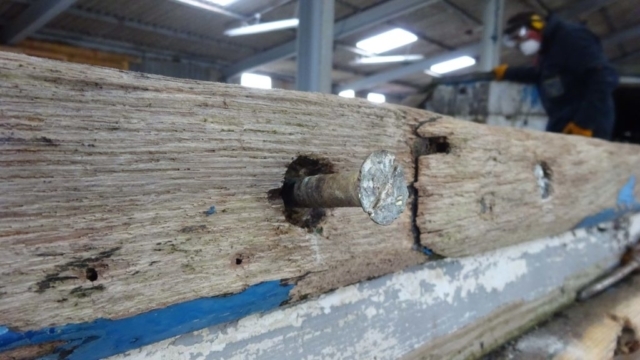 Remaining exposed nails, screws and bolts removed. All fittings removed from fo’c’sle. Phase 1 complete – all rotten wood, unwanted materials, old caulking, fittings and paint now removed or stripped. 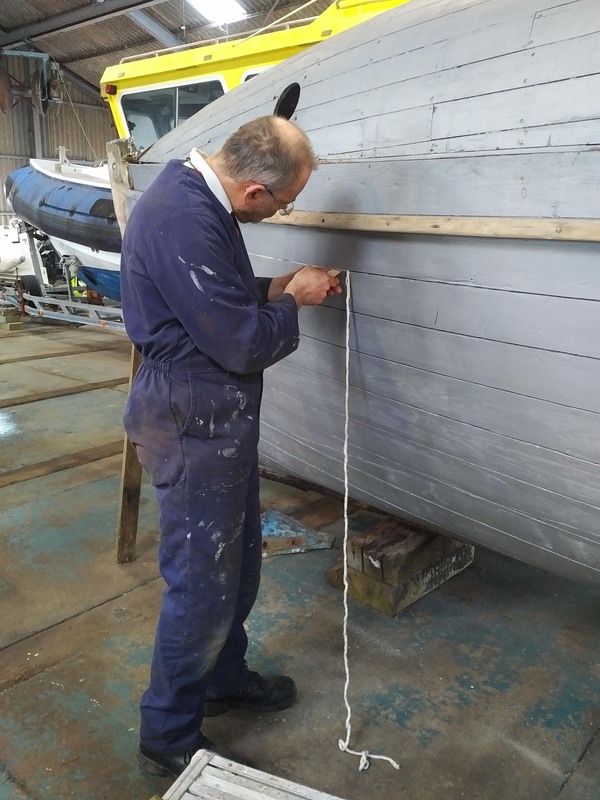 Phase 2 started – prop buffed to a mirror finish & plastic wrapped, paint priming of wood started, Professionals start fitting new wood. 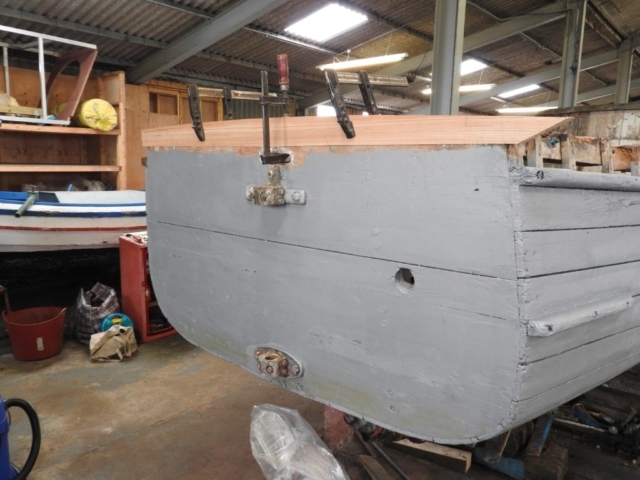 Priming of the main surfaces completed. Reconstruction of rotten wood accelerating. 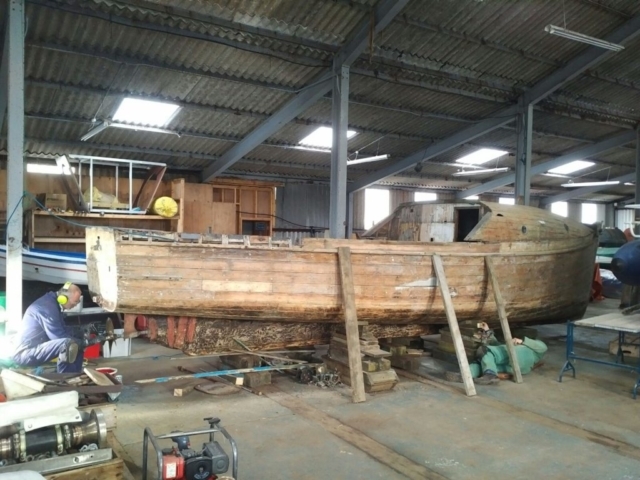 Is she currently in My fathers boatyard at Ness in Stromness?